You know the good old food pyramid that looked back at you from your cereal box, the drawing with bread and cereals as its base and a tiny point urging you to use fats, oils and sweets sparingly? Well, the U.S. Departments of Health and Human Services and Agriculture, which designed the pyramid, has taken a new look at nutrition. With the release of its updated Dietary Guidelines for Americans, the federal government is taking aim at a population that is increasingly overweight. The main message of the guidelines is that you should manage your weight through healthy eating, but also through regular vigorous exercise. Good nutrition, maintaining a healthy weight and regular physical activity are the keys to help youn avoid illness and stay healthy. 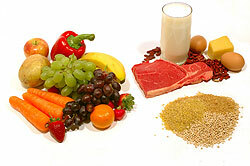 Adequate Nutrients Within Calorie Needs. In general, the guidelines recommend a balanced diet that limits saturated and trans fats, cholesterol, sugar, salt and alcohol. In addition, some people are urged to add certain vitamins to their diet by eating fortified foods or taking supplements. For example, people over 50 should get more Vitamin B12, and older adults, dark-skinned people and people who get little exposure to sunlight need more Vitamin D. Women of childbearing age and pregnant women need additional iron and folic acid. Weight Management. Everyone is urged to maintain a healthy weight by balancing the calories you take in from food and drink with the calories you expend in exercise. To avoid gaining weight over time, you should slightly decrease the calories you take in and increase the amount of exercise you get. Physical Activity. People of all ages are urged to exercise more. At the very least, adults should get at least 30 minutes of moderate exercise almost every day, and most people can do more than that. To avoid gradual weight gain, you should aim for 60 minutes of exercise on most days. And if you are trying to lose weight, you should exercise for 60 to 90 minutes a day. This exercise should include aerobic work for cardiovascular conditioning, stretching for flexibility, and weights or calisthenics to build strength and endurance. Food Groups to Encourage. Unlike the old food pyramid, which rested on bread and cereals, the new guidelines emphasize fruits and vegetables. A 2,000-calorie-a-day diet should include at least 2 cups of fruit and 2½ cups of vegetables. And no eating just iceberg lettuce and potatoes. The guidelines say to choose vegetables from each of the five subgroups: dark green, orange, legumes, starchy vegetables and other vegetables. In addition, you should eat at least three servings of whole-grain products per day, and at least half of the grains you eat should be whole grains. Finally, everyone should drink 3 cups of fat-free or low-fat milk or milk products every day. Fats. Less than 10 percent of your daily calories should come from saturated fats. Your total fat intake should be only 20 percent to 35 percent of your total calories and should come mainly from polyunsaturated and monounsaturated fats like fish, nuts and vegetable oils. Keep cholesterol and trans-fat consumption as low as possible. Carbohydrates. In general, the guidelines urge you to get your carbohydrates from fiber-rich fruits, vegetables and whole grains, and to avoid added sugars or other sweeteners that add calories. Sodium and Potassium. Most people should consume less than 2,300 mg. of sodium a day, which is equal to about 1 teaspoon of salt, and middle-aged or older people, African-Americans and people with high blood pressure should have no more than 1,500 mg. To accomplish this, avoid using salt when you prepare food and avoid foods that are high in sodium. Instead, eat foods such as fruits and vegetables that are full of potassium. Alcoholic Beverages. People who choose to drink should do so moderately – only one drink per day for women and two for men. Some people, such as children, alcoholics and pregnant women, should not drink at all. And no one should drink if they have to do something that requires attention or coordination, like drive. Food Safety. Keep your hands and your kitchen clean, and wash fruits and vegetables before eating them. Cook food thoroughly and refrigerate promptly. Keep raw food separate from cooked food and don't consume unpasteurized milk and juice, raw eggs, undercooked meat and poultry, or raw sprouts.